After the sheeply vest project, I needed to do something else for a while. All the washing, carding and spinning + knitting was rather intense there for a while, but I am proud to have finished my plan! I was going up north, and it is always a good idea to bring some handywork. My parents live in a quite remote area, with not much to do. I really don't mind that, but I need to keep my hands busy. I hadn't been tatting for some time, so I brought my shuttles and thread. 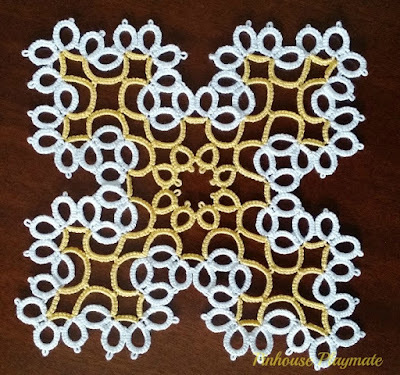 There are lots of great tatting blogs online, and a generous lot of them offer some free patterns. Great for us newbies to get some practise. Tatting by the Bay is one very good one, and there I found this lovely square pattern, named Priscilla. Very lovely, but filled with joins that are so easy to forget, and varying stitch count in the different rings. I have a monkey mind (very prone to wandering) and am used to knitting, which you can do while watching/listening to the telly. None of that with this one, so I quickly learned to concentrate. 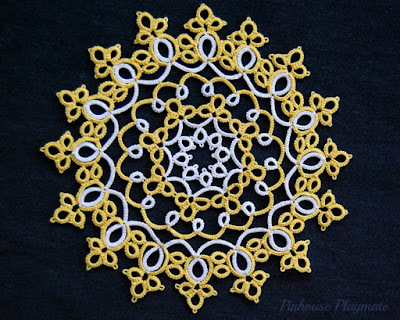 I probably tatted this pattern as much backwards (to pick up the faulty tatting) as I did forwards. Ooopsie! The Priscilla square, in crochet cotton. The border is made up of small crowns, and I just used my trusty crochet yarn to test it. 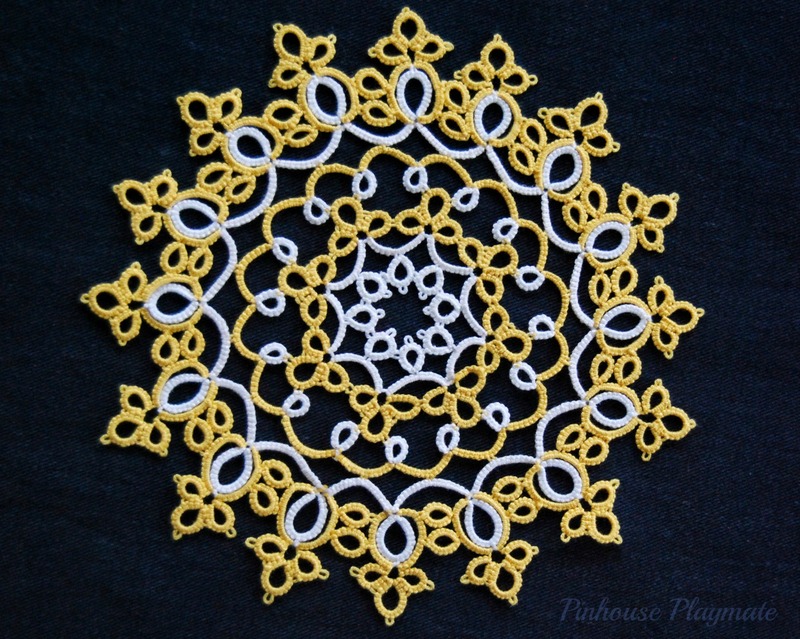 The thread is quite thick in comparison with tatting thread, and not as nice, but it is cheap and will do for practise. As I got going, I quite liked it, so I decided to finish it as a small tablecloth/napkin thing. I have plans for future hankerchiefs, so this was an excellent opportunity to try both the border and tiny hand rolled hems. I was quite happy with the result, but the corners on the border was not described in the pattern, so I had to make them up as I went. 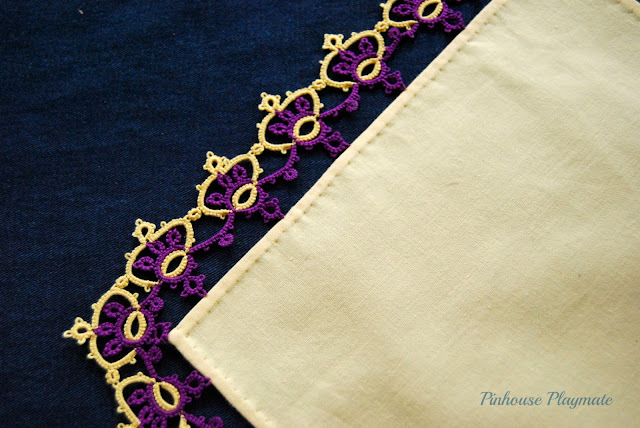 The border is tatted separate from the cloth, so when I sewed it on, they wouldn't lay flat. Need to work on that next time around. Happy with the hem on the cloth though! Not as fiddly as I feared. Lastly, I've tatted my first little doily. 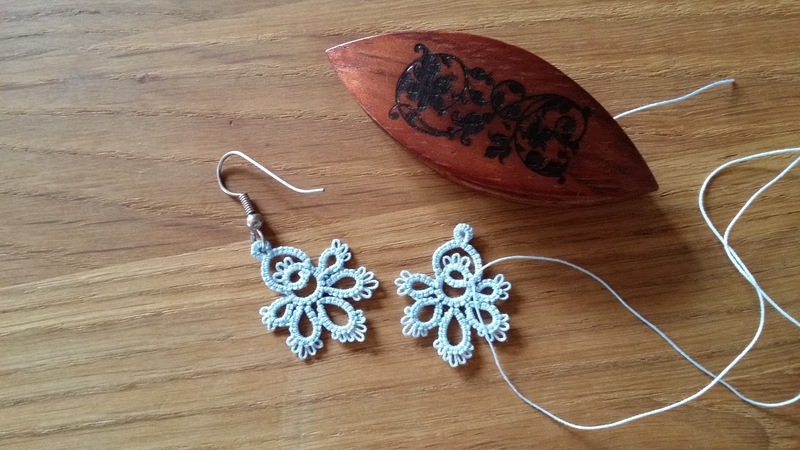 The pattern is also from Tatting by the Bay, and is free here. 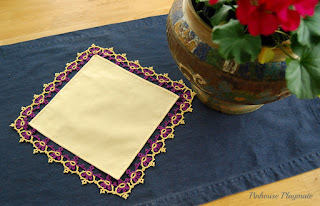 It is called the Frauberger doily, and was actually a quick tat. I finished it in two evening sessions, not bad for me, I think. I will make this again, in proper thread, I still find it nice to test tat the patterns first, as I am still learning and making mistakes. Better do that with cheap thread. Frauberger doily, in chrochet cotton. This is real cotton candy! Wow, the difference! I am in the middle of a new project now that is meant for gifts, but as a sneak peek I can show you these ear rings that I made from scrap thread left on my shuttle. Cute, huh? Turning 40 (in a while) isn't all that bad!! Wow, time has really flown by these past weeks since Easter. I think it's the longer brighter days, my energy is up and we've had some glorious spring weather here in the south of Norway lately. Windy, but still nice :) So ideal for gardening and running. I took a road trip up north to visit my parents some weeks ago now, to cheer myself up. It totally worked, and it is always so nice to be "home". Even though I've had my own home for many years, home is still with my mum and dad. I'll never be too old for that :) It is a very long drive, just over 2000 km there and back, but all that is forgotten as soon as I set foot on their doorstep. This visit also had a special agenda, as I have been so fortunate to inherit my Grandmothers spinning wheel! There was no way we would risk sending it in the mail, so I had to go get it. I didn't even know it excisted in our family, but luckily, my father hung on to it after she passed. 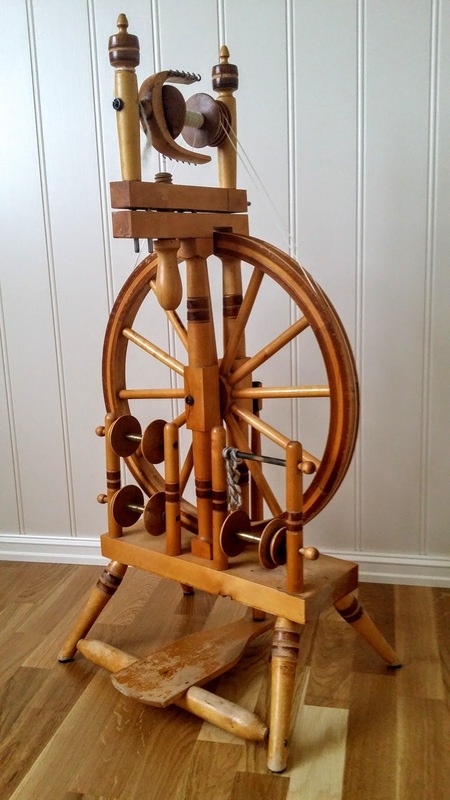 I knew my grandmother was a very thrifty and crafty woman, but I never saw her using a spinning wheel. We lived some distance apart, and didn't see eachother as much as I wish we did. I was always very fond of going to see my grandma when I was little, and have many good memories. As I turn 40 later this summer (sigh), I got the spinning wheel as a present in advance, complete with carders and everything! Isn't it beautiful? I just love the thought of getting to use and love something that used to belong to my gran. It really means alot to me. As you all may know, my spinning knowledge is limited to the drop spindle, but I did try the wheel out up north, and I actually managed to spin something yarn-like. Operating a spinning wheel is a bit like patting your head with one hand, and circling your other hand over your tummy, but once you crack the code it becomes second nature. I have not been spinning since I got home, there has instead been some great progress on my new sewing space (yay!!) 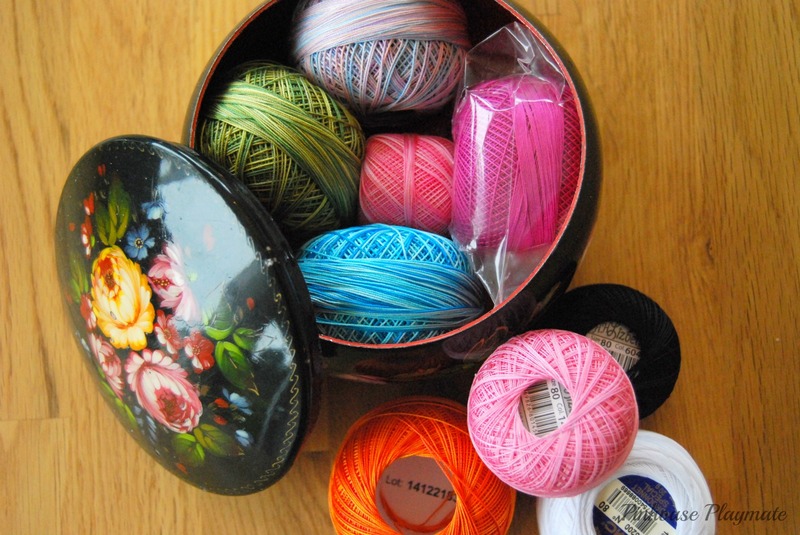 and some tatting, but I plan to sit myself down soon with my lovely wheel :) My big box of wool is just waiting for me to get spinning! Therapeutic crafting pt.2 - result! After spinning an amount of wool of both colors, it was time to put it to good use. I had 138 grams of grey yarn, and 110 grams of white. Total yardage was somewhat of a mystery, but I figured it would be enough for a decent project (not a headband....heh). 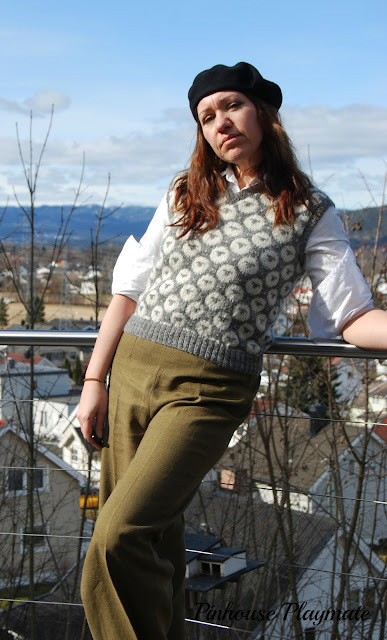 I have always loved the look of those fair isle knitted vests or pullovers from the 1940s, and decided that it would be a good project to test my yarn. It should be fairly quick to knit, and easy too, since there is minimal making up/ piecing together. I wanted the design to be all my own, and pulled out my grid sketch book and dabbled away. 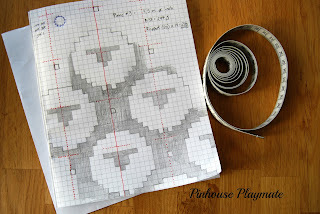 I ended up with this stylized sheep pattern, and then knit a test square for gauge and needle size. Based on this test square, I could then calculate the amount of stitches for my size, and also how the armhole and neck opening would be. I opted for a V-neck, as I think it looks smart paired with a collared shirt. I used a 3mm round needle for the whole vest, I could probably have used a 2.5mm for the ribbing, but I had no suitable round needle in that size. 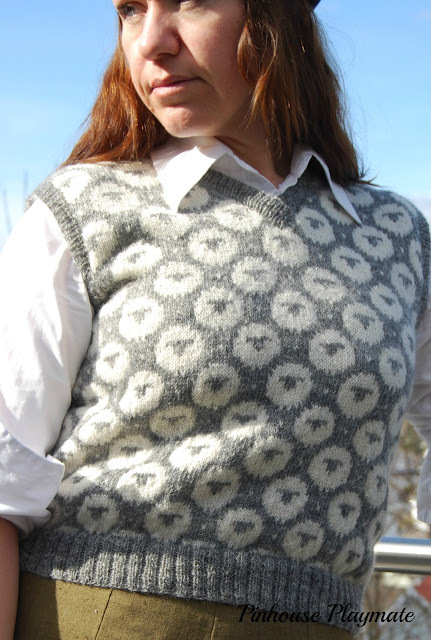 I knit in the round up to the armholes, and then the rest back and forth. 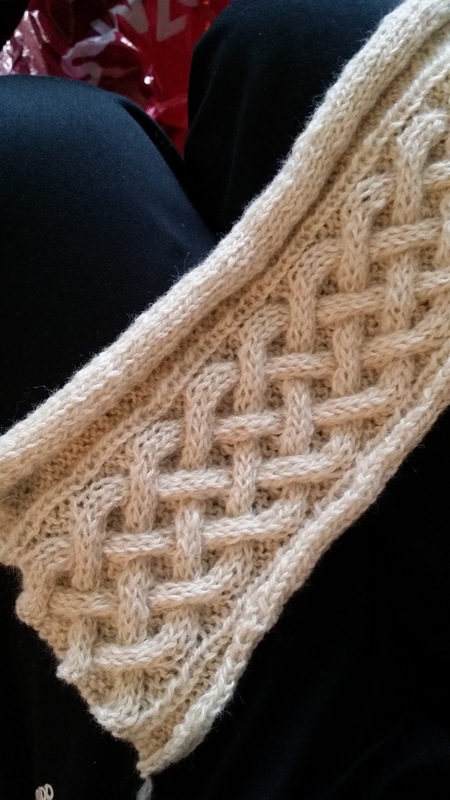 It was very quick, and in about a week of evening knitting I was weaving in the last ends. It has been a fun process, and it really makes you appreciate the work that women put into knitted garments in the olden days. 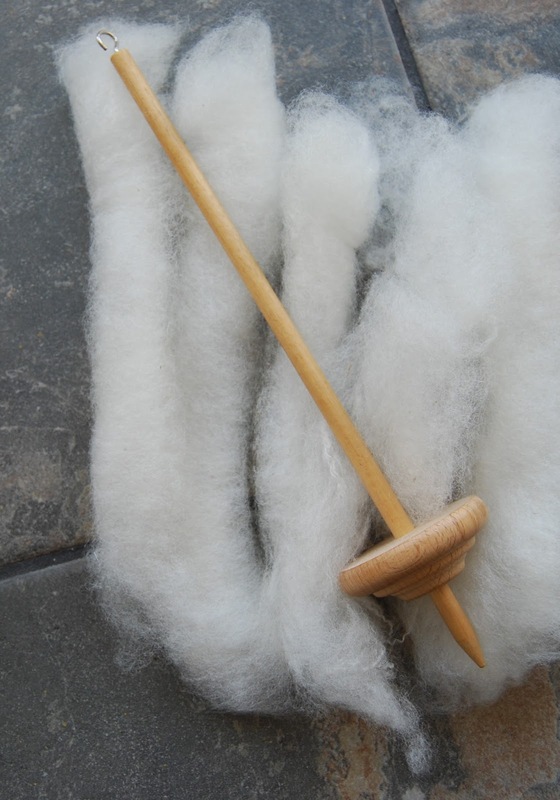 Spinning yarn by hand on a spindle is slow work, and any sane person uses a spinning wheel for bigger projects. But sometimes it is not about getting the object finished, it is about the process. My spinning is still just in its infancy, and I suspect there will be lots more spinning and other woolly shenanigans in the future. Therapeutic crafting - yet more new skills! One rainy day in February, the decision was made to get out of the house after weeks and weeks of not doing anything or seeing anyone. The sportscar club in which the entire Pinhouse household is member, was having the annual Icetrack Day on the fields of a farm belonging to the very woman that gifted me that humongous haul of vintage patterns last year. I left the driving to the Mr, and all the other car enthusiasts, and slipped away for tea inside with Hilde. She is a wonderfully soothing person to be with, she is also a multi-talent doing most crafts imaginable to man. And best of all, she loves to share. We talked for hours, drank gallons of tea and best of all, she taught me how to spin wool! Looking back, I definitely have a tendency to do a whole array of different things. It would seem I have not one hobby, but rather my hobby is to learn new skills. This is both a blessing and a curse. Learning new things is very rewarding, useful, and good for the brain. On the other hand, it can be a little restless, and I never loose myself in one thing, to master it. Maybe if I specialized in something, that something would end up being my profession. But in a world of wonderful and diverse crafts, how do you choose only one? No, I don't see that happening at all :) I don't have that kind of self control. Spinning wool into yarn really is a simple process. Twisting fibres together to form a long strand, and that is it. The fun starts when you start spinning different fibres, plying the threads together, and seeing the uniqueness unfold. There are no set rules (well, very few), you can spin the yarn however you like. And then there is dying fibres, and your yarn turns into an explosion of color! The possibilities are endless. All you need to get started, really. I went home from my day with Hilde, totally energized. She sent me home with a drop spindle and a small bag of wool fibre, and I was sold! I spun that bag of wool in a matter of days, and just HAD to have more. 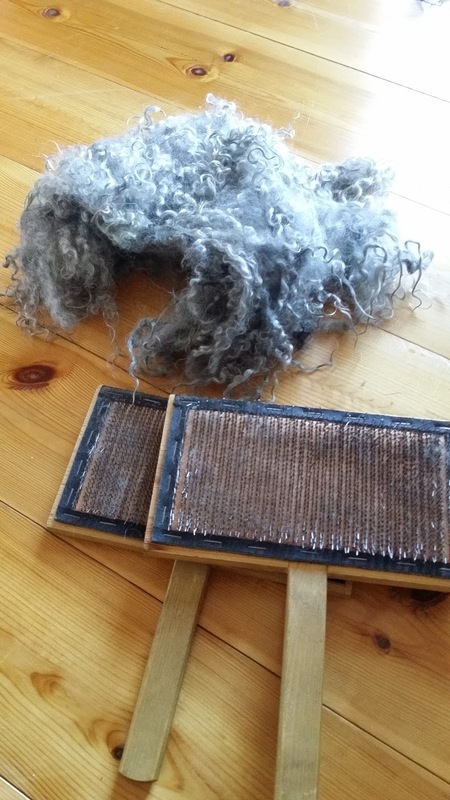 Fibres for spinning comes in a wide variety of options, everything from raw unwashed felts straight off the sheep (or other hairy animals like rabbits, goats, camels etc) to ready-to-spin, pre-carded and pre-dyed rolls of clean fluffy stuff. 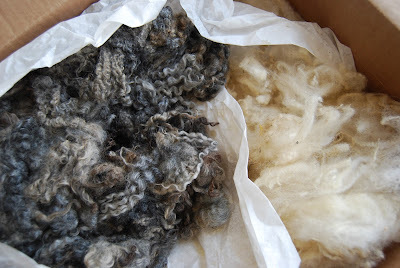 Being a person who like to learn as much as possible and also save a penny, I opted for the raw stuff straight from the barn, and in the mail came a huge box of grey and white sheep-smelling stuff! Oh the bliss! Raw wool from two different breeds of sheep. 10 kg of wool is A LOT. It all had to be sorted roughly by color, the shorter bits had to be discarded, and any plant material removed. Then the wool needs to be soaked to remove dirt (poo and pee) and excess oils, then dried and carded by hand. Once cleaned and carded into fluffy fibres, the spinning can begin. When first starting out, the only objection is to make something that holds together. It gets uneven in thickness and somewhat wonky, (aka novelty yarn) but all normal. After a bit of practice, the thread gets thin and even, and the thought of beautiful garments made from your own fine yarn emerges in ones brain. 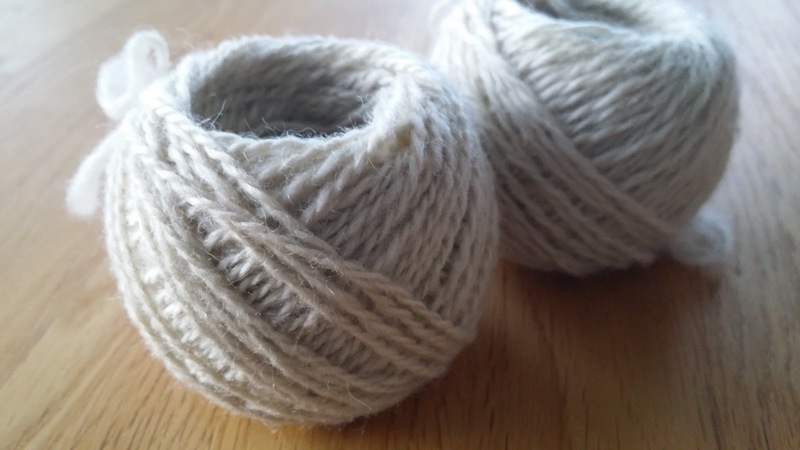 To make this yarn, one have to spin two (or more) individual threads that are plied together. The only rule in spinning is that each thread must be twisted in the same direction (say, clockwise) and then plied the opposite (counter-clockwise) direction the get the strands of the yarn to lay together. All else is up to you. My first balls of 2-ply (novelty) yarn. First attempt at knitting my own yarn. My first balls of yarn filled me with pride, but putting it to use (knitting) made me aware of how differences in thickness affected the finished product. I tried to make the small balls into a headband thingy, but when I came to ball #3 it was just too bulky. Changing needles midway was no option, but all this was part of the learning. 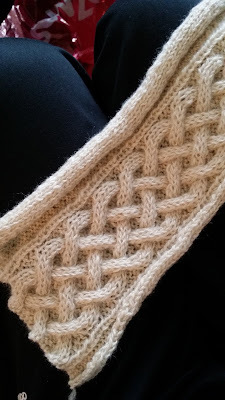 In the end, there was no headband, but I got some practice cabling before frogging it. 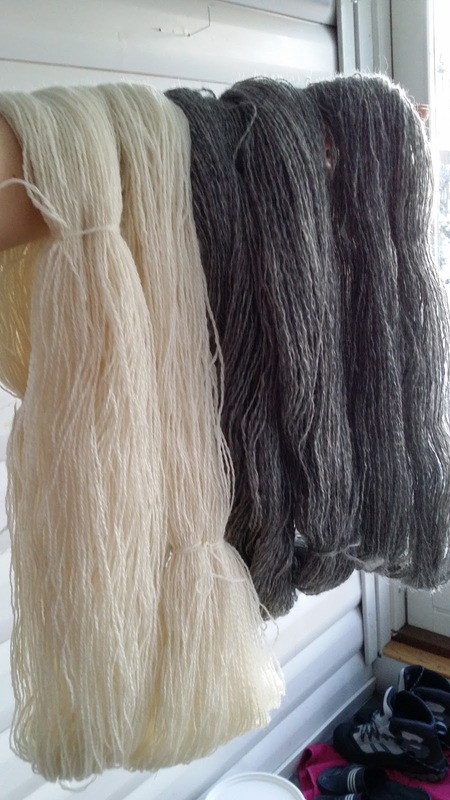 I concentrated on spinning thin, and soon I was making skeins of uniform yarn for my project. Next time, I'll show you what this wool eventually got turned into. I'll tell you, getting back to creating things again was good for my soul. I am glad I allowed myself to let go of the pressure of doing the right things, and just doing something that makes me happy. There is a lot of therapy in creativity.